Robin is using the Statue of Liberty’s torch to illustrate this warning to the US, alluding as well to the Anglo-Zulu War in 1879. By the 1870s the UK had colonies in southern Africa bordering on various Boer settlements (especially the South African Republic), the Zululand and other native African kingdoms, and numerous indigenous tribal areas and states. The secretary of state doe the colonies Henry Howard Molyneux Herbert, 4th Earl of Carnarvon, who had overseen federation in Canada in 1867, seeking to unify the region in a similar fashion, named Sir Bartle Frere high commissioner for Southern Africa in 1874. Sir Theophilus Shepstone, the secretary for native affairs in Natal, annexed the South African Republic in 1876, followed by other British acquisitions. In 1878 Frere presented Zulu king Cetshwayo with an ultimatum that he knew would be unacceptable and in January 1879 ordered lieutenant general Frederick Augustus Thesiger (2nd Baron Chelmsford) to invade Zululand. 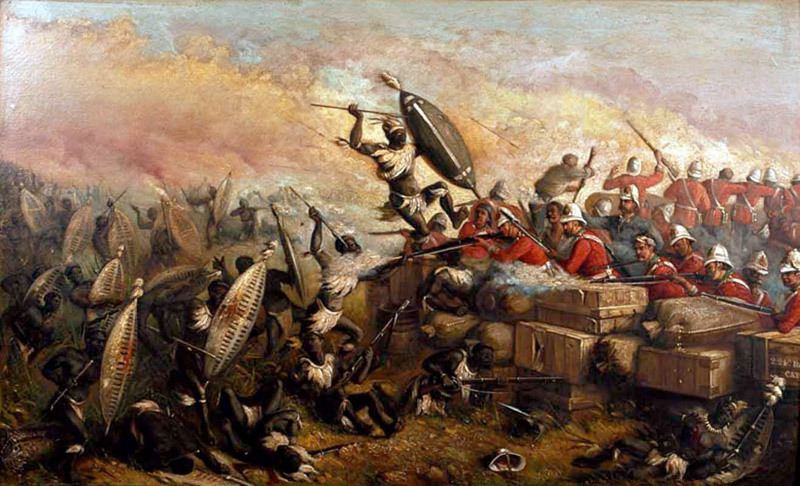 On 22 January Chelmford’s force was overwhelmed at Isandlwana by 20,000 spearmen under Ntshingwayo kaMahole Khoza and withdrew from the kingdom. After heavily reinforcing his army, Chelmsford resumed the assault in June, defeating the Zulus at Ulandi on 4 July.Chelmsord was replaced by Sir Garnet Wolseley, and on 28 August Cetshwayo was captured and sent to Cape Town and imprisoned on Robben island until 1883. Wolseley deposed the ruling dynasty and divided Zululand into 13 chiefdoms.